Residence halls will remain OPEN for the Thanksgiving break! During Thanksgiving Break, residents may remain in their room for all or any part of the break at no extra cost. There are no forms or paperwork that need to be completed to allow residents to stay. Residence hall staff will enter student rooms to conduct a visual health and safety check. This will be a scaled down version from the mid-semester inspections. Staff will inspect rooms to ensure all doors and windows are locked, excessive trash has been removed, and that other checklist items have completed. Keep your room locked and your key(s) and identification card in your possession at all times. Close all exterior doors when entering or exiting. Never prop doors open or let others prop doors open. Lock your windows when out of the room. Call University Police, 336-758-5911, if you observe unusual behavior by strangers or any person unauthorized to be in your building. Make it a priority to know who the other residents are in your building during the break period. Never walk alone on campus. Guests or friends may be entertained during the break, but no parties are permitted. ALL LEASED LOUNGES ARE CLOSED. During the break, dining hours may be reduced or eliminated. For specific hours, please refer to Deacon Dining’s website at deacondining.com. Store all food in closed containers. Remove perishables. Personal property should be moved off the floor. Remove all trash and recyclables from your room and common areas to outside containers. Take bicycles home or store them on designated bike racks (not in hallways, on balconies, under stairwells, or attached to banisters). Motorized bikes are NOT allowed in the residence halls or under breezeways; these should be parked in designated moped spaces. Key(s) and identification, including passports, should not be left in room. Take all valuables (i.e., computers, books, money, medications, clothing, etc.) that may be needed during the break. This can also be a precaution against theft or damage. Unplug all items from wall outlets. MicroFridge© units should remain plugged in, but please dispose of any perishable food. Leave blinds down if your room is on a ground floor or faces a balcony. Pull blinds up if your room is on an upper floor and does not face a balcony. 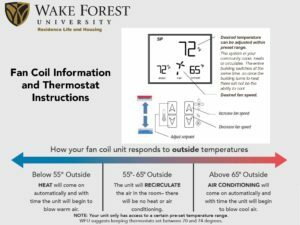 Fan coil units should be set to 70° and low fan speed. Close and lock all windows and room door(s). 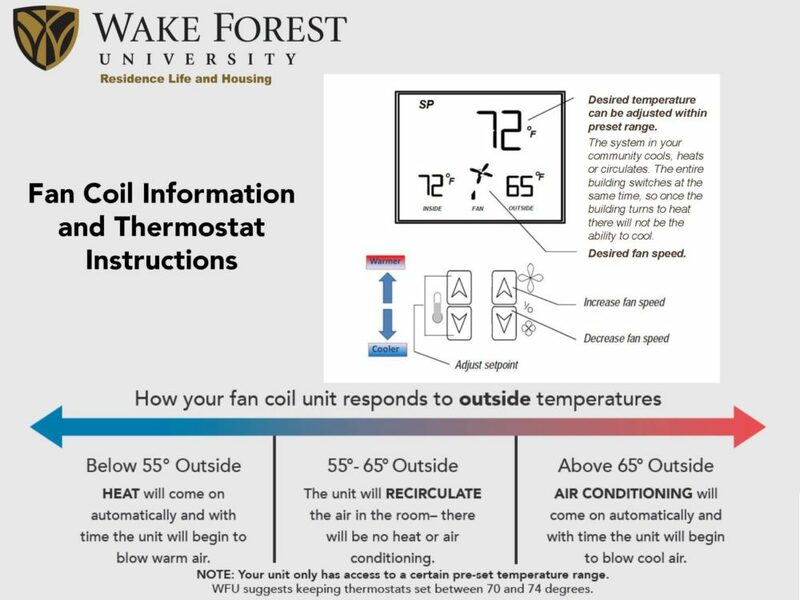 Wake Forest University staff will enter student rooms during the break to perform inspections and for routine maintenance. During this time we will lock all windows and doors. Administrative action, billing and/or student conduct referral can result if unauthorized items or unsafe/unclean conditions are found. All staff members are expected to report the presence or evidence of pets, weapons, illegal substances, lounge furnishings, fuel or other prohibited items (see the Guide to Community Living). For details on break parking, please visit the Transportation and Parking Services website or contact Transportation and Parking Services at 336.758.PARK (7275) or parking@wfu.edu. If you are driving home and need to load your vehicle, you should follow the direction given in the Rules and Regulations. Pack your items prior to bringing your vehicle from satellite and freshman parking. Cars parked for extended periods of time will be ticketed. Parking in a fire lane, handicapped or other reserved spaces will subject you to ticketing or towing (even with blinkers on). Students may use student, 15 min. and 30 min. spaces to load your vehicle. See your hall staff or contact the Office of Residence Life and Housing at housing@wfu.edu or 336-758-5185. ALL residence halls close and residents must depart campus by noon on Sunday, December 16, 2018. Residence halls open for students to return on Saturday, January 12, 2019, at 9 a.m.
All residents must vacate their rooms for the entire break. All residence halls, apartments, and houses will be closed and locked during the break. Why Can’t I Stay Longer? Due to safety and security reasons, we are unable to remain open during the Winter Break. Students will not be permitted to remain in their rooms for any portion of the break. In addition, students will not be permitted back into their rooms for any reason, including to retrieve forgotten items. Take anything of value with you as a precaution against theft and damage. Take any belongings you may need over the break such as books, skis, medication, checkbook, passport, plane tickets, clothing, jewelry, etc. Remember to keep your room and car doors locked while loading your vehicle for departure to help prevent theft. Live trees and other live decorations are not allowed in residential facilities. Artificial trees and decorations may be used as long as they are fire retardant and are placed away from radiators, fan coil units, kitchens, lamps, or other heat sources. All holiday lighting and wiring must be undamaged and labeled Underwriters Laboratory (UL) approved. Lights are only allowed in a single-strand and should be plugged into a single outlet. Lights may only be hung using electrical tape; do not hang lights using staples, nails, or tacks. For those in our Road Houses, outside lights are permitted on decks as long as they are plugged into a ground fault interrupt (GFI) device. No additional holes may be placed in the building to hang lights. Lights should be unplugged whenever they are unattended and should not be left on overnight. Candles, incense, and other open flame items are never permitted in campus housing. Other holiday decorations may be placed on bulletin boards and room doors. Decorations should not be placed near radiators, fan coil units, kitchens, or other heat sources. All decorations used should be made of nonflammable materials, such as foil, metal ornaments, artificial wreaths, and flame retardant paper. Corridor walls, elevators, and fire exits should not be decorated. Residents, please complete prior to departing campus for Winter Break. Remove perishables and store all food in closed containers. Return To-Go containers to The Pit to receive your deposit back; if you fail to return a container you will have to pay for a new one for the Spring semester. Move all personal property off of room and suite floors. 72 hours prior to departure empty, defrost, unplug, and clean personal mini-fridges and MicroFridges. Ensure that water from defrosting is cleaned up and leave refrigerator and freezer doors open. Remove ALL items from common area refrigerators and freezers. This includes all refrigerators in Polo, Martin, NCA, Student Apts, and Road Houses. Do not turn the common area refrigerators off; they will be defrosted and cleaned over the break. Remove ALL items from bathrooms, countertops, and community kitchens. This allows these areas to be cleaned over break while avoiding avoid any potential accidental breakage or removal of the items. Take bicycles home or store them on designated bike racks (not in hallways, on balconies, under stairwells, or under bannisters). Motorized bikes are NOT allowed in the residence halls or under breezeways; these should be parked in designated moped spaces. Key(s) and identification, including passports, should not be left in room. All doors will be locked during inspections. Take down any and all string/strand lights. Unplug all items from wall outlets. Move all personal belongings at least 24” away from fan coil units to allow units to be serviced during the break. Failure to comply with the items on the checklist may result in a minimum improper checkout charge of $50.00 and/or referral to the University’s student conduct process. Students involved with sorority recruitment will receive details regarding their return to campus via email. You can also visit the Fraternity & Sorority Life website for more information. Students may remain on campus for all or any part of Spring Break. The residence halls are open. Students’ card access is limited to only their hall and/or suite. Keep individual rooms locked and key(s) and identification card in one’s possession at all times. Close all exterior doors when entering or exiting. Never prop doors or let others prop doors. Call University Police, extension 911, if unusual behavior by strangers is observed or any person unauthorized is in the residence hall. Make it a priority to know who the other residents are in the residence hall during the break period. Never walking alone on campus. Call University Police at 336.758.5591 if one becomes locked out of one’s room. Guests or friends may be entertained during the break, but no parties or activities are permitted. ALL LEASE LOUNGES ARE CLOSED. Many of the Wake Forest Dining Service’s facilities are either closed or have limited operation hours during the Spring Break period. Please contact Dining Services at extension 5607 for additional information or visit wfu.edu/dining. Remove all trash and recyclables by 7 p.m. on Friday, March 8, 2019. Take all valuables (i.e., computers, books, money, medications, clothing, etc.) that may be needed during the break. This will also be a precaution against theft or damage. Close and lock all windows, room and apartment doors. Key(s) and identification card should not be left in resident’s room. Remove any items that may be blocking or have been placed on or near the air conditioner/heater unit. Clean all Common Area refrigerators and remove all personal items in these refrigerators. Unplug all electrical appliances (fish tanks, surge protectors, alarm clocks, and computers) from wall outlets. Do NOT unplug MicroFridge units. Fan coil units are to be set on 70° and low. Personal property should be moved off the floor. This could avoid loss or damage if there is an unforeseen facility issue. Take bicycles home or store them in residence hall rooms (no motorized bikes are allowed in the residence halls). Pull blinds down if room is on a ground floor or faces a balcony. Leave blinds up if room is on an upper floor and does not face a balcony. Turn off lights and lock room door. All rooms will be inspected regardless if the student remains on campus during the break period. To avoid improper check out and/or housekeeping charges, students must comply with each item on the above check list. 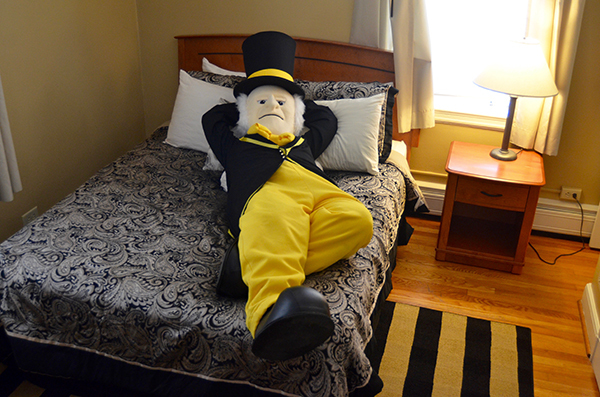 See your hall staff or contact Residence Life and Housing via e-mail at housing@wfu.edu or telephone at 336.758.5185.